I know, right? Two Christian-type movies in a row. I did that on purpose. 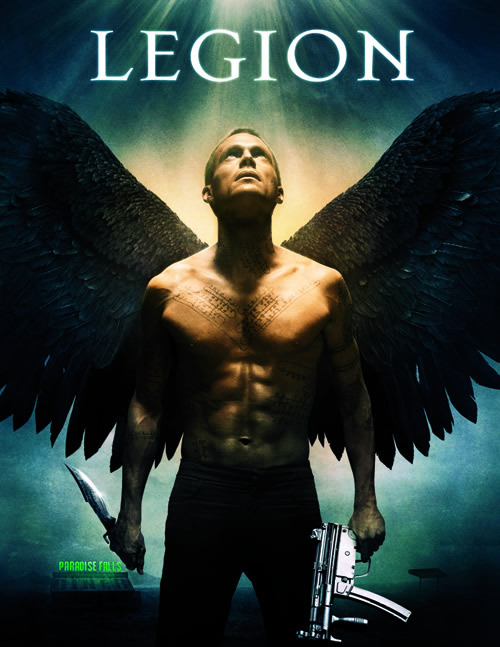 Legion is an apocalyptic film starring Paul Bettany (The Da Vinci Code) as Archangel Michael, who has come to Earth to fulfill God’s orders to destroy humankind by killing a child, but then he defies those orders to save humanity. He still believes in the humans, thinks that God has only lost faith in them and needs to be reminded of His love, and he fights for them against a legion of angels sent to carry out the command, led by the favored Gabriel. By the way, the angels seem to possess the bodies of weak-willed humans. It was such an interesting concept, I found myself cataloging all the people I know that would have been possessed. Watch out, folks, I have guns. *smirks* Bullets apparently seem to work quite well. That tagline makes absolutely no sense for this movie. Just ignore it. I have. Wait, I’ll tell you why it makes no sense. The angels haven’t fallen if they’re acting on God’s orders. And it can’t be that it means fallen in battle because of the second half of the tagline. So yeah … makes no sense. The only thing that makes any kind of remote sense is “fallen to Earth,” but, really? I’m still not buying it. This is not your typical Armageddon tale, or end of the world prophecy well-known to Christians. The writers and director have used their imaginations (gasp, I know) and stepped outside the box for this tale. Guess what? That happens now and then. This is Director Scott Stewart’s first major film release, and he’s normally on the visual effects end of things in film production. Dennis Quaid, Charles S. Dutton, and several others make up this cast of wayward characters who find themselves stuck in a diner in the middle of the desert at the beginning of the end of the world. You have your prim and proper couple with the frigid wife, the about done annoyed husband, and the rebellious teenage daughter who’s dressed like a hoochie just to piss off her parents. The diner waitress (who is pregnant with the child Michael is supposed to kill), Charlie, smokes and shame on her for doing that, but it’s realistic, so I’m not going to give too much flack. Charlie, of course, wants nothing to do with Jeep (who thought up that name and why? Was he conceived in a Jeep? ), who is completely and totally in typical crestfallen nerdy love with her. Can we say stereotypes? Of course we can, but hey, it makes the story work, right? *shrugs* Maybe. Tyrese Gibson, cutie that he is, plays a lost traveler who stops at the diner to find his way. He’s dressed all gangsta-like, and ends up shooting the old lady who likes to walk on walls, but he does a good job with body language because I totally picked up on the shaking pistol and that he’d never shot it or killed anyone before, unlike the rest of the cast because they all seem to be ignorant to body language. Can we get a hells yeah for Tyrese’s character Kyle being something other than what he seemed? Abso-freaking-lutely. Charles S. Dutton’s role just wasn’t big enough. He’s a damn talented man, but I will say that his dialog with Kyle on top of the diner roof was powerful and beautiful. Dennis Quaid plays a washed up man whose wife left him years ago, and all he has left are the diner and his son, Jeep. Bob Hanson: You know this is crazy, right? I mean… I don’t even believe in God. Michael: Well, that’s just fine, Bob. He doesn’t believe in you either. 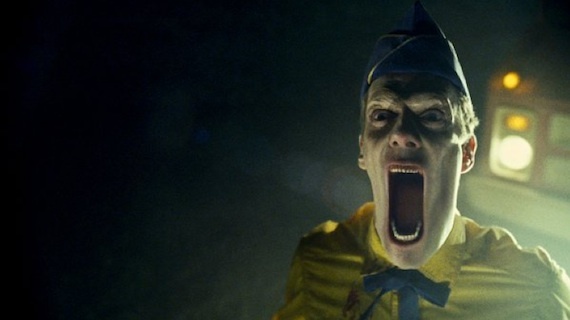 Creepiness ensues in this movie not only with the little old lady who climbs walls and walks across ceilings all Exorcist style, but also with the Ice Cream Man, played by Doug Jones. He’s like a human pretzel. The Ice Cream Man hits the top of the creepy factor for me. SFX did an awesome job with him and that whole scene. There’s quite a bit of predictability in this movie, and I won’t spoil any more of it for you, but I’d definitely say the movie is worth watching. The entertainment value is there if you just sit back and watch it for that. If you’re looking for anything else, you may be offended (if you’re a religious type), and you may not like it much. Angels aren’t always the good guys, my friends. I give this movie 2 Jinxes. It’s good, not great, and I did like it. I thought that it had a lot of potential and that some great effects and ideas were wasted. I'd give it the same score as you. I actually laughed out loud at some bits. Only 2 Jinxes? Is that good? You go on the golf score scale, right? Yeah, I know I should know these things, but you know I'm easily confused. What are we talking about again? Right, Legion. I liked the movie a lot. Lot of good character development with some of the main people and I FELT for them. Then again, it did seem like the makers spent a bit too much time watching Prophecy and trying to figure out how to make as cool a movie.